, Rothenberg, CQ-Roll Call and RealClearPolitics—to put their ratings in the same place and on the same map. You can find it at maps.google.com/elections2010. This gadget is powered by the highly flexible yet simple-to-build-on Fusion Tables, which directly integrates into Google Maps API v3. 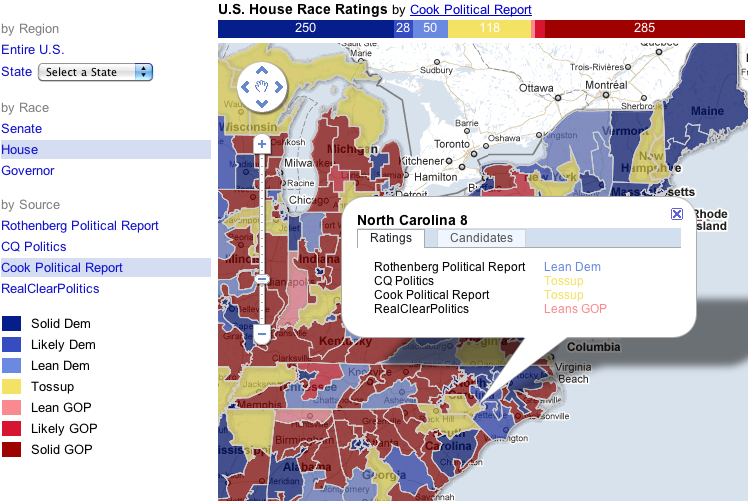 Even if you’re not a programmer, there's a lot that you can do with Fusion Tables to manipulate and visualize data, and in the spirit of the season, check out our new tutorial that demonstrates how to analyze Census data by congressional district and share what you’ve come up with.